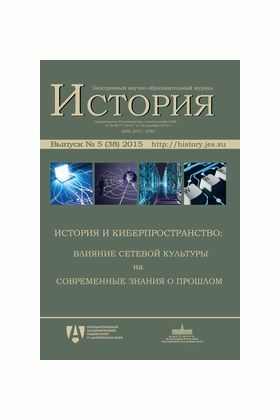 This issue is based on articles written by participants of The Russian Foundation for Basic Research grant № 11-06-00412 «History and cyberspace: system analysis and mathematical modeling of processes» 2011—2013. Several articles are written by scholars who are not related to grant. These articles are based on conferences and discussions concerning present project. Issue is opened with the article by M. A. Lipkin and D. S. Sekirinskiy which bring up problem interinfluence of network and academic culture. There are also quantitative and qualitative analyses of the Russian blogosphere examining historical topics in Live Journal. Subject is followed by detailed analysis of content and knowledge of past representations in V. V. Zvereva’s article which is founded on VK social network. Analysis of network knowledge of past inevitably lead us not only to studying of popular blogs. M. S. Bobkova’s article is concerned with new transfer channels of historical knowledge through web-based media. Previous article is followed by research made by A. V. Shubin. It is subject-oriented article about the role of historical myths, quantity and quality of which correlated with the informational digital technologies development. Network culture limits and opportunities issues are raised in article by G. V. Bakus and A. S. Mahov in the face of international legal discussions concerning copyright in the Internet. In addition the problem of professional history as a science is raised, because of mass digitalization and publication of historical sources in the Internet. These theoretical and subject oriented articles are followed by subject-empirical abstract reviews of most popular internet discourses on famous topics for the period of 2012—2014 (1812 war anniversary, study of armory, Simon Petliura) in articles by N. V. Promyslov, K. A. Elokhin, D. K. Knorre. History and Cyberspace: Triumph of Digital Culture or the “End of History”?